Thank you to Arbor Scientific for letting me borrow a Rotational Inertia Demonstrator to … uh … demonstrate rotational inertia. This is an AP Physics 1 Topic. Want a Rotational Inertia Demonstrator? Have you ever struggled to describe Rotational Inertia to your students? Even worse, have you ever struggled to understand Rotational Inertia yourself. (I know I have. ) Did you know Rotational Inertia is the same as Moment of Inertia? Yeah, I’m with you there. I did not know the name had been changed until recently. However, I do think Rotational Inertia is a more logical phrase than Moment of Inertia. Well, if you would like some help with the concept of Rotational Inertia, then I highly suggest the Rotational Inertia Demonstrator from Arbor Scientific because it is an easy way to demonstrate the concept of rotational inertia. The demonstrator is composed of three pulleys of different sizes all centered around the same axle. Attached to the pulleys are four spokes on which four masses can be placed. The distance from the axle, or axis of rotation, of the four masses on the spokes can be adjusted. The rotational inertia of a system of particles equals the sum of the quantity of the mass of each particle times the square of the distance each particle is from the axis of rotation. While the Rotational Inertia Demonstrator does not appear to be a system of particles, the equation for the rotational inertia of a system of particles helps us to understand how the rotational inertia of the demonstrator changes when we adjust the locations of the four adjustable masses. The closer the four adjustable masses are to the axle, or axis of rotation, the smaller the “r” value in the rotational inertia equation and the smaller the rotational inertia of the demonstrator. We also need to review the Rotational Form of Newton’s Second Law of Motion to better understand rotational inertia. The net torque acting on an object equals the rotational inertia of the object times the angular acceleration of the object. Please remember torque and angular acceleration are vectors. Notice the similarities to the Translational Form of Newton’s Second Law of Motion. The net force acting on an object equals the inertial mass of the object times the linear acceleration of the object. Again, remember force and linear acceleration are vectors. Force is the ability to cause a linear acceleration of an object. Torque is the ability of a force to cause an angular acceleration of an object. Torque is the rotational equivalent of force. Rotational inertia is the rotational equivalent of inertial mass. Angular acceleration is the rotational equivalent of linear acceleration. But, what does it mean that rotational inertia is the rotational equivalent of inertial mass? Inertial mass is the measurement of the resistance of an object to linear acceleration. Therefore, rotational inertia is the measurement of the resistance of an object to angular acceleration. In other words, the greater the rotational inertia of an object, the more that object will resist an angular acceleration. Referring back to the rotational inertia demonstrator, the farther the four adjustable masses are from the axis of rotation, the larger the “r” value in the equation for the rotational inertia of a system of particles, therefore the larger the rotational inertia of the demonstrator. The larger the rotational inertia of the demonstrator, the larger the resistance of the demonstrator to angular acceleration. In summary, the larger the distance the four adjustable masses are from the axle, the larger the rotational inertia, and therefore the larger the resistance of the demonstrator to angular acceleration. This is demonstrated below by hanging a 100-gram mass from the largest pulley in two simultaneous demonstrations. In the demonstration on the left, the four adjustable masses are close to the axis of rotation and therefore the rotational inertia of the system is smaller. In the demonstration on the right, the four adjustable masses are farther from the axis of rotation and therefore the rotational inertia of the system is larger. When both demonstrators are simultaneously released from rest, because the net torque caused by the 100-gram masses is approximately the same, the demonstrator with the larger rotational inertia on the right has a smaller angular acceleration. In other words, the demonstrator with the larger rotational inertia speeds up rotationally at a slower rate. Going back to the Rotational Form of Newton’s Second Law of Motion, because the net torque is almost the same, a larger rotational inertia results in a smaller angular acceleration. Notice we are always keeping the four adjustable masses the same distance from the axle, or axis of rotation. This is to keep the center of mass of the system at the axis of rotation of the system. When the four masses are not equally spaced from the axis of rotation, then the center of mass of the system is offset from the axis of rotation and the force of gravity acting on the system causes a torque on the system. The force of gravity causing a torque on the system makes understanding the demonstration much more complicated. In the examples shown below, the demonstrator on the left with four masses equally spaced from the axle rotates at almost a constant angular velocity. The demonstrator on the right has one mass farther from the axis of rotation and therefore the whole system actually becomes a physical pendulum. The system oscillates back and forth in simple harmonic motion. While this is interesting, it does not provide an obvious way to learn about rotational inertia. In summary, it is much easier to learn about rotational inertia from the demonstrator if all four masses are equally spaced from the axis of rotation. Because the 100-gram mass is hanging from the small pulley on the left and the large pulley on the right, the “r” vector for the small pulley is smaller and therefore the net torque acting on the demonstrator through the small pulley is less. Therefore, according to the Rotational Form of Newton’s Second Law of Motion, the angular acceleration of the demonstrator on the left is less than the angular acceleration of the demonstrator on the right. Our last set of demonstrations has both demonstrators with identical rotational inertias and masses hanging from the smallest pulleys. Also, both demonstrators have a 100-gram mass hanging over the left side of the pulley. However, the demonstrator on the right has a second mass, a 200-gram mass, hanging over the right side of the pulley. This means the demonstrator on the right has two different masses hanging off of the smallest pulley. In order to determine what is going to happen, remember the Rotational Form of Newton’s Second Law of Motion includes net torque not just torque. In this example, the net torque from the two masses on the demonstrator on the right actually has roughly the same magnitude as the net torque acting on the demonstrator on the left, however, the directions are opposite from one another. Again, both demonstrators have the same rotational inertia, are using the same pulley, and have a 100-gram mass hanging over the left side of the pulley. The pulley on the right adds a 200-gram mass hanging over the right side of the pulley. 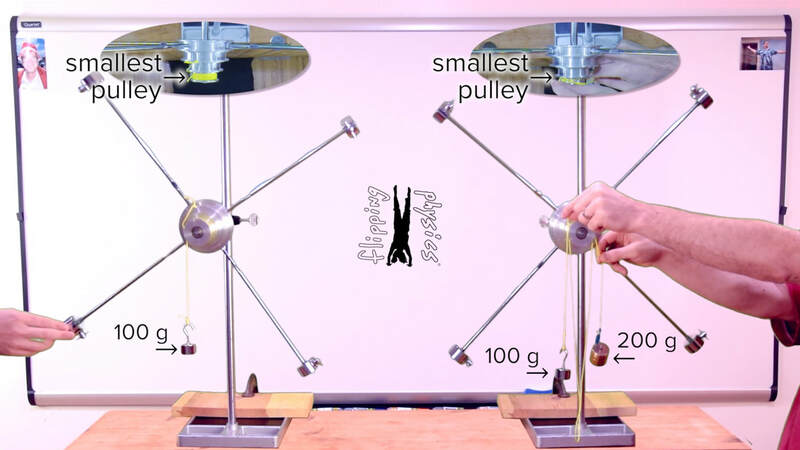 For the demonstrator on the right, the 100-gram mass hanging over the left side of the pulley essentially cancels out 100-grams of the 200-gram mass hanging over the right side of the pulley. This effectively means the right demonstrator essentially has a 100-gram mass hanging over the right side of the pulley. Therefore, the net torques on both demonstrators have essential the same magnitude and opposite directions. Therefore, the angular accelerations of both demonstrators should have roughly the same magnitude and opposite directions. You can see that is true in the demonstration. But why do the two demonstrators have “roughly” the same magnitude angular accelerations? Adding the 200-gram mass to the demonstrator on the right increases the total mass of the system. Because inertial mass is resistance to acceleration, increasing the total mass of the system actually decreases the angular acceleration of the system a little bit, even though the net torque should be roughly the same. Proving this requires drawing free body diagrams, summing the torques on the wheel, and summing the forces on each mass hanging, so I am not going to walk all the way thought that solution here. There are many more ways you can make adjustments to the rotational inertia demonstrator to better help understand rotational inertia. For example, ask yourself what would happen to the angular acceleration of the demonstrator if the only change we make to it is to increase the mass hanging from the demonstrator? Increasing the mass hanging from the demonstrator increases the net torque acting on the demonstrator. The rotational inertia remains the same. Therefore, according to the Rotational Form of Newton’s Second Law of Motion, the angular acceleration of the demonstrator will increase. What if the only change we make is to change the locations of the four adjustable masses from all being at their farthest extreme positions to having two of the adjustable masses near the axis of rotation and two adjustable masses far from the axis of rotation? Bringing two adjustable masses near the axis of rotation decreases the rotational inertia of the system and therefore, according to the Rotational Form of Newton’s Second Law of Motion, the angular acceleration of the demonstrator will increase. Notice, this will only work when the two close adjustable masses are opposite one another and the two far adjustable masses are also opposite one another. If this is not the case, the center of mass of the rotational inertia demonstrator will not be at the axle, or axis of rotation, which is a problem we addressed earlier. The pulley sizes of the rotational inertia demonstrator are provided by Arbor Scientific. They are 20.22 mm for the small pulley, 28.65 mm for the medium pulley, and 38.52 mm for the large pulley. Given this information, we can even predict which way the rotational inertia demonstrator will rotate if we were to hang 100-grams over one side of the large pulley and 200 grams over the other side of the small pulley. Before releasing the demonstrator, the angular acceleration of the demonstrator is zero because it is at rest. Therefore the torque caused by the 100-gram mass will be 0.3852 meters times 0.100 kilograms times 9.81 m/s^2 times the sine of 90 degrees which equals roughly 0.38 N.
The torque caused by the 200-gramm mass will be 0.2022 meters times 0.200 kilograms times 9.81 m/s^2 times the sine of 90 degrees which equals roughly 0.40 N.
Therefore, the net torque caused by both masses acting on the demonstrator before it starts to accelerate is the difference between these two torques because they act in opposite directions. Please realize these torque calculations are only correct while the demonstrator is at rest. Once the demonstrator begins to accelerate, the force of gravity and the force of tension acting on the mass hanging are no longer the same and we would need to draw free body diagrams and sum the forces on each hanging mass. Thanks for reading and I hope you use the Rotational Inertia Demonstrator from Arbor Scientific to better understand rotational inertia!